How Do You Factor a Polynomial Using the A-C Method? Factoring trinomials can by tricky, but this tutorial can help! 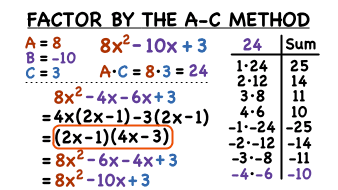 See how to use the A-C method to factor a trinomial into the product of two binomials. Then, use the FOIL method to multiply the two binomial back together to check your answer. How Do You Factor a 4-Term Polynomial by Grouping? Factoring by grouping is one way to factor a polynomial. This tutorial shows you how to take a polynomial and factor it into the product of two binomials. Then, check your answer by FOILing the binomials back together! How Do You Find the Degree of a Monomial? Monomials are just math expressions with a bunch of numbers and variables multiplied together, and one way to compare monomials is to keep track of the degree. So what's a degree? Well, if you've ever wondered what 'degree' means, then this is the tutorial for you. How Do You Find the Greatest Common Factor If There are No Common Factors? To find the greatest common factor (GCF) between numbers, take each number and write it's prime factorization. Then, identify the factors common to each number and multiply those common factors together. What? There are NO factors in common? Then the GCF is 1. This tutorial gives you one such example. Check it out!